It is a sea of green in capital markets to start the week as global stocks and US index futures bounced amid boosted risk sentiment as investors eyed the resumption of trade talks between the United States and China, albeit guardedly now that Trump and Xi are not expected to meet until after the March 1 "springing tariff" deadline, while watching for signs of progress on Brexit. Safe havens such as Treasurys dropped as the dollar strengthened for an eighth day, its best run in three years. While it remains highly unlikely that anything definitive will emerge from this week's latest trade walks, risk sentiment was boosted after Axios reported on Sunday night that Trump’s advisers discussed holding a summit with Chinese leader Xi Jinping next month, meanwhile China said Vice Premier Liu He will join U.S. Trade Representative Robert Lighthizer and Treasury Secretary Steven Mnuchin in trade talks in Beijing on Feb. 14-15. The renewed trade optimism came amid growing worries about a slowdown in global growth and U.S. politics which have been foremost in investors’ minds. Safe-haven bonds and the dollar have gained amid the prolonged uncertainty. Still, stocks have had a good year so far with MSCI’S All-Country World Index up nearly 10% since the start of the year. The index was nearly 0.2% higher on Monday. The rising threat to growth means equity markets will partly depend on earnings from major U.S. companies for clues about the health of consumer shares. These include Coca-Cola Co, PepsiCo Inc, Walmart Inc, Home Depot Inc, Macy’s Inc and Gap Inc. Analysts now expect first-quarter earnings for S&P 500 companies to decline 0.1 percent from a year earlier. That would be the first such quarterly profit decline since 2016. Asia was led by a rebound in Chinese shares, which resumed trading after a week-long Lunar New Year holiday, led by gains in small caps, while the Shanghai Composite closed 1.4% higher. The rest of Asia traded mixed while Japan’s securities markets are shut for a holiday. While China struck an upbeat note as talks resumed, it also expressed anger at a U.S. Navy mission through the disputed South China Sea, casting a shadow over the prospect for improved Beijing-Washington ties. Australian stocks recouped some losses to end 0.2 percent lower. South Korea’s KOSPI index was up 0.2 percent. Indonesian and Indian benchmarks were in the red. That left MSCI’s broadest index of Asia-Pacific shares outside Japan slightly higher after it fell from a four-month high on Friday. Trading volumes were generally light, with Japan on public holiday. Europe's STOXX 600 index rebounded from one-week lows, helped by some deal-making and gains in mining and banking shares, rising as much as 1%, with all sectors in the green as banks and miners lead advance. Banks rose over 1% as lenders from Italy, Spain said their capital is above the ECB’s requirement. Basic resources rose +1.2% as miners and steelmakers in demand following soaring iron ore and as rebar futures spike in China, while defensive healthcare (+0.3%) is the laggard of the gauge. 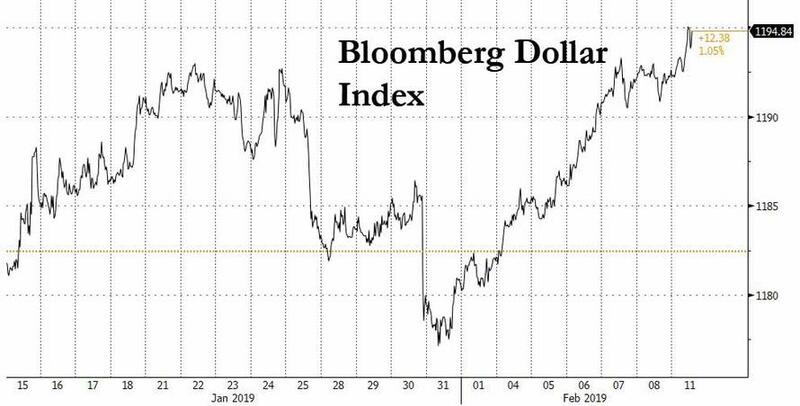 In currencies, Bloomberg dollar index firmer for eighth straight day, its longest winning streak since 2016 while China’s yuan extended its decline sliding 0.9% to 6.7952 per dollar, its biggest drop since Feb. 8, 2018. There was no trading in the onshore yuan all of last week due to Lunar New Year holidays in China as the dollar strengthened 0.9% over the break. The Dollar also saw support from U.K. data that keeps sterling under pressure, options demand for euro downside exposure and a mini "flash crash" in the Swiss franc. The Bloomberg Dollar Spot Index advanced as much as 0.3% to touch its strongest level since Jan. 4; there was no trading in cash Treasuries in Asia as Japan’s financial markets are shut on Monday for a holiday. EURUSD slipped 0.2% to 1.1297, lowest since Jan. 24; tests key three-month trendline support as risk reversals rally amid euro-area political risks. Cable also dropped, sliding -0.4% to 1.2895, before steadying near 1.2900 handle; low came after data showed gross domestic product growth missed expectations at 0.2%, compared with 0.6% in the third quarter. The Swiss franc flash crashed, plunging almost one percent at the start of Asian trading before quickly rebounding to trade near unchanged; the Swiss franc was sold against the dollar and yen as dealers exploited thin holiday liquidity to execute a stop-loss run, traders said. The Australian dollar inched up from Friday’s one-month lows, although sentiment was still cautious after the country’s central bank opened the door to a possible rate cut. In rates, fears of economic slowdown in Europe and plunging inflation expectations dominated morning trade on Monday. Germany’s 10-year government bond yield remained close to 0.10. T-note futures were quiet with cash Treasuries closed for Japan holiday. The yield on Germany’s 10-year Bund, considered the risk-free benchmark for the region, fell as low as 0.77 percent on Friday, its lowest since October 2016, reflecting concern in bond markets about economic conditions. Aussie curve flattens as 3-year yield jumps two basis points. Yields on Treasuries and core European sovereign bonds edged higher. In the latest Brexit news, British Prime Minister Theresa May has rejected the idea of a customs union with the European Union, ending hopes she would shift her Brexit policy to win over the opposition Labour Party. May will promise lawmakers a second opportunity to influence the Brexit talks later in the month in a bid to stave off any rebellion from within her own party by those who fear Britain could end up leaving without a deal. In commodities oil prices slipped on concern about slowing global demand and a pick-up in U.S. drilling activity, while gold headed for its first drop in three sessions. U.S. crude was 0.6% lower at $52.42 per barrel. Brent was flat $62.12. Dalian iron ore opens limit up to catch up with last week’s ex-China rally. Swiss franc’s move may have been initially triggered by a data entry error that triggered off computer trades based on pre- entered algorithms, said Rodrigo Catril, a senior FX strategist at National Australia Bank. GBP/USD drifts down 0.1% in a second day of declines. All Major European Indices are in the green [Euro Stoxx 50 +0.8%], strengthening from the mixed trade seen in Asia overnight. FTSE MIB (+1.5%) is the outperforming index largely due to strength in banking names, with Banco BPM (+7.2%), BPER Banca (+5.6%), UBI Banca (+3.5%) and Intesa Sanpaolo (+1.9%) in the green following ECB SREP capital requirement updates. Following this, all sectors are higher with some outperformance seen in the financial sector. Other notable movers include Smith & Nephew (-4.8%) who are towards the bottom of the Stoxx 600, after reports that the Co. are to acquire NuVasive in a deal worth over USD 3bln. Elsewhere, Euronext (+0.6%) have been choppy after they increased their offer for Oslo Bors; who have stated they still prefer a takeover by Nasdaq. Just Eat (+2.1%) are in the green as shareholder Cat Rock Capital have stated the Co. should engage in merger discussions. In terms of US premarket news, Apple’s iPhone shipments to China decreased by an estimated 20% in Q4 as Huawei’s grip on the market strengthened; the Co. are up by around 0.3% in the pre-market. In FX, the Dollar remains underpinned heading in to the next round of US-China trade talks, and with further impetus derived from ongoing weakness in rival currencies. The DXY has inched higher as a result and is now testing nearest resistance around 96.809 ahead of 97.000 and the next upside chart target at 97.116. JPY - The G10 underperformer and major mover, partly due to thinner trading conditions overnight as Japanese markets were shut for National Foundation Day. However, the Jpy was also hit by cross demand and the headline pair has subsequently cleared last Monday’s 110.16 high that had been containing gains to trade up at 110.27. CHF/GBP/NOK- Also considerably weaker, but the Franc has recovered relatively well from an abrupt slide to almost 1.1000 vs the Usd and back through 1.1400 vs the Eur as a combination of stops and model-driven buy orders were triggered in the aforementioned illiquid holiday impacted Asian session, with some talk that the move could have been prompted by an erroneous trade. Note, the Chf largely shrugged off in line Swiss CPI in stark contrast to Sterling and the Norwegian Krona that both extended losses in wake of data (GDP, IP, manufacturing and construction output in the case of the former, and inflation for the latter). Indeed, Cable fell from circa 1.2955 to around 1.2895 and only a few pips from the 100 DMA (1.2892), while Eur/Nok climbed to just shy of 9.8400 vs sub-9.7700 at one stage. EUR - Notwithstanding the cross Jpy demand noted above, the single currency has dipped under 1.1300 vs the Greenback to test bids/support around key downside chart levels at 1.1296 (30 DMA) and 1.1289 (current 2019 low). No fresh bearish catalyst or new driver, but the Eur is still being undermined by slowing Eurozone growth, inflation and political jitters. RUB - The Rouble has been choppy between 65.3975 and 65.7655, with initial strength seen following Moody’s ratings upgrade whittled away by the generally bid Usd and another dip in Brent crude prices. In commodities, Brent (-0.3%) and WTI (-0.9%) prices have weakened on the cautious risk tone ahead of this week’s US-China trade talks. In terms of recent news flow UAE Energy Minister Al Mazroui has stated that the OPEC+ compliance was excellent in January, he sees a balanced oil market in Q1 2019 and no further action is required by OPEC+. In spite of Friday’s Baker Hughes Rig Count which saw oil rigs increase by 7, adding to the concern that record US production will hamper the OPEC+ production cuts. Separately, the Venezuelan Oil Minister stated that their oil output is currently at 1.57mln BPD, and the country are looking to expand their cooperation with India. Looking ahead OPEC are due to release their monthly oil report tomorrow, which includes January production estimates; separately, the IEA are to release their report on Wednesday. Gold (-0.5%) prices are weighed on by dollar strength, in spite of the uncertain risk tone seen overnight ahead of US-China trade talks. Elsewhere, iron ore futures have jumped up by over 8% today as China returns to the market following the holiday period for Chinese New Year. Separately, UBS say the iron ore market faces a deficit of 30mln tonnes due to the Vale dam collapse. Looking at the day ahead, there is no data due in the US however we will get revisions to the CPI index. We're also due to get China's January foreign reserves data at some stage. Away from that, the ECB's Guindos is due to speak while UK Brexit Secretary Barclay is expected to meet with EU Chief Brexit negotiator Barnier for talks on negotiating a new Irish backstop. Earnings highlights include Chegg, NorthWestern Corp and Michelin. Morning from Riyadh where it’s raining. I’ve been here a handful times before and have never previously seen a cloud. I was in Dubai yesterday presenting at two conferences and being at the airport made me nostalgic. Indeed 10-12 years ago the Dubai airport and malls would be resplendent in British people buying cheap duty-free goods and buying bigger and bigger suitcases to take them back in. Fast forward to today and my rough calculations suggested that the British Pound doesn't get very far here these days with a number of items more expensive than at home. Where did it all go wrong? So I’m already well into my week and after a quiet one last week for newsflow, the next few days sees a number of events that should attract more attention after what was a nervous end to the slow past week. 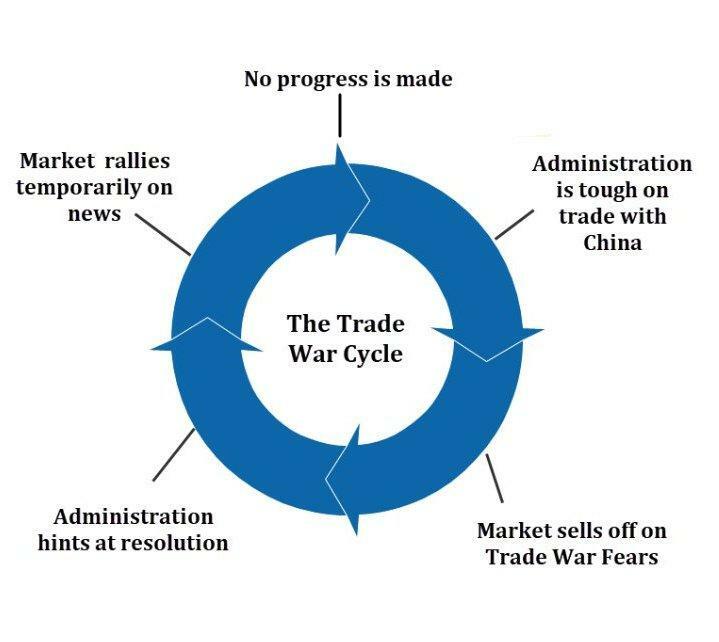 European growth downgrades and concerns that the US/China trade war might not get resolved by the March 1st deadline saw a negative end to the week for risk as you’ll see if you scroll down. First let’s look at the highlights ahead. US CPI (Wednesday) and a first look at Q4 GDP in Germany (Thursday) might get the most headlines data wise. Trade (Thursday), credit and CPI (Friday) data in China will also be worth a watch as will UK GDP (today) and inflation (Wednesday). Another busy week for UK Parliament on Brexit awaits while the threat of a US government shutdown is still in play for the end of the week. Does it matter? During the 35-day shutdown that ended last month the S&P 500 was up +10.27%. Elsewhere, expect trade headlines to not stray too far from the market's view while earnings and a busy week for central bank speak should also keep us busy. Digging into some of the above in more detail now. The US CPI report on Wednesday is probably most notable for a round of BLS revisions where history could be rewritten a bit. The last time the BLS made a quality adjustment, wireless telephone plan amendments had the impact of lowering core CPI yoy by around 20bps. The BLS has indicated that starting this January standalone and bundled packages of residential telecommunications services, which are comprised of land-line telephone services, internet services and electronic information providers, and cable and satellite television service, will begin to be quality adjusted to account for the rapid technological change in these products. So, watch this space. Assuming neutral adjustments, the consensus is for a +0.2% mom core reading with base effects expected to result in a decline in the annual rate to +2.1% yoy from +2.2%. Other US highlights are the delayed December retail sales report (+0.4% mom core expected) on Thursday, initial jobless claims on Thursday (which have spiked in the last couple weeks so worth a watch), and January industrial production report (+0.1% mom expected) on Friday. PPI (Thursday) merits attention as the health care component feeds into core PCE the Fed’s preferred inflation gauge. In Europe, with increasing talk of a slowdown, all eyes will be on the flash Q4 GDP report in Germany on Thursday. The consensus is for a +0.1% qoq reading which as a reminder follows a negative reading in Q3 (-0.2% qoq). It’s not impossible that Germany could be in a technical recession. Along with that data, Brexit will almost certainly remain a talking point next week with weekend press reports suggesting that PM May is going to request more time before she puts her deal to a fresh vote while she has more talks with the EU. It seems that if she hasn’t had a fresh meaningful vote by February 27th then she’ll allow Parliament to vote on alternatives. The compromise two weeks ago saw many Tory lawmakers back the PM but many of the soft or no-Brexit Tories will likely rebel in favour of trying to remove no-deal Brexit from the table if she doesn’t soon succeed in these last chance saloon talks. We have another motion from May put to Parliament on Thursday with many MPs scrutinising the wording so as to see whether they can give her one last chance to salvage her deal before they effectively take over the process. Finally, it's worth noting that UK Brexit Secretary Barclay is expected to meet with EU Chief Brexit negotiator Barnier for talks on negotiating a new Irish backstop today, so expect further headlines then. Staying with politics, Friday marks the deadline that stopgap funding for the US government expires. That means that if there is no resolution on the border wall issue, President Trump could potentially shut parts of the US government again. Talks broke down again over the weekend supposedly over immigration detention beds but we’ll see if they get resurrected early this week. The latest update appears that the Republicans and Democrats are not communicating for now. Elsewhere, earnings season is starting to wind down now in the US with about 66% of companies in the S&P 500 having reported. There are 63 companies due report this week including Chegg and NorthWestern on Monday, Sabre on Tuesday, Cisco and Paramount on Wednesday, Coca-Cola and Nvidia on Thursday, and Pepsi on Friday. In Europe we're due to hear from Michelin, Thyssenkrup, Metro, Akzo Noblel, Heineken, Nestle, Credit Suisse and RBS next week. Other potentially interesting events to keep an eye on this week include Euro Area finance ministers meeting on Tuesday to discuss the European Commission's economic forecasts and the EMU and EU budget in Brussels. Italian PM Conte is also speaking on Tuesday to the European Parliament as part of a series of debates on the future of Europe while OPEC's monthly oil report is out on the same day. As for the ever important and market sensitive trade talks, while Trump has suggested that he won’t meet Xi before March 1st, US Trade Representative Lighthizer and Treasury Secretary Mnuchin are leading a delegation to Beijing this week. Deputy-level negotiations are expected to start as soon as today before meetings with Lighthizer and Mnuchin start on Thursday and Friday. So, expect headline watching in markets again. In the meantime, Axios reported over the weekend that White House officials have informally discussed the prospect of having a summit between Trump and Xi Jinping around mid-March. Speaking of China, markets have reopened this morning following the Lunar New Year holiday last week and they’ve made a strong start with the Shanghai Comp and CSI 300 up +0.77% and +1.16% respectively. The Hang Seng (+0.23%) is also slightly higher along with the Kospi (+0.04%). 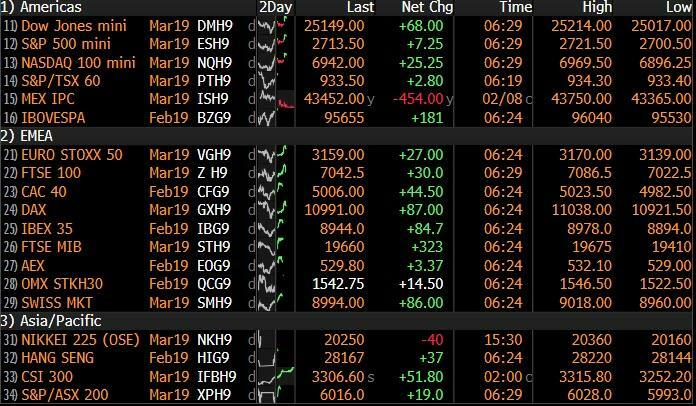 We should add that markets in Japan are closed today which means Treasuries haven’t started trading yet while futures in the US are down ever so slightly. As for last week, equity markets took a roundtrip, with the S&P 500 initially gaining as much as +1.20% before dropping to as much as -0.91% for the week – but ultimately closing near flat at +0.05% (+0.07% on Friday). Other markets had similar volatility, with the NASDAQ paring gains of over 2% to end the week +0.47% (+0.14% Friday). In Europe, equities performed slightly worse, with the STOXX 600 ending -0.46% (-0.56% Friday) and the DAX shedding -2.45% (-1.05% Friday). Chinese markets were closed for the lunar new year holiday, but the MSCI EM index shed -1.40% (-0.57% Friday). Volatility actually declined on the week despite the big moves, with the VIX down -0.4pts (-0.7pts Friday). Data in Europe continued to deteriorate and DB and the European Commission downgraded their 2019 growth forecasts across the euro area. The most notable downgrade from the EC was Italy, from 1.2% to 0.2%. 10-year BTP yields rose +21.1bps (+0.8bps Friday). Bunds rallied -7.9bps (-2.8bps Friday) to close below 9bps for the first time since October 2016, leading the 10-year Italian spread to widen by the most since last September. Treasuries also rallied, by -5.2bps (-2.5bps Friday), while the dollar rallied +1.09% (+0.13% Friday) for its best week since last August. Credit was mixed, as HY cash spreads widened +3.4bps (+4.7bps Friday) in the US, but tightened -0.2bps (+5.5bps Friday) in Europe. This entry was posted on Monday, February 11th, 2019 at 7:22 am and is filed under Immediately available to public. You can leave a response, or trackback from your own site.